Western winds to interact to eastern winds! New system less powerful in Pakistan! The country experienced a powerful Winter storm ’18’ that brought countrywide rainfall with scattered destruction as well as 40 people died in during February 3 till February 6. The winter season is not over yet as another western system is moving towards the country, it is of less intensity and its more northern than its predecessor but due to local instability (atmospheric conditions) it could cause isolated stray thunderclouds to form over many parts of the country. No significant change in temperature is seen, a slight warming trend may occur. 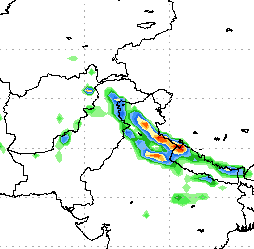 Due to interaction of eastern-western moisture, heavy rainfall/snowfall at times locally very heavy might occur over north-western India till February 17 morning/mid-day. On night/late night of February 14, Western disturbance ’19’ would enter into north-western Balochistan and continue till move towards northern areas of Pakistan, on February 15 late, some mature thunderstorms could form over western states of India near Pakistan. On February 17 mid-day/evening, western disturbance ’19’ would have become insignificant. This time, the weather will be more active in India than in Pakistan, as forecasted by PWP since February 6, western disturbance ’19’ atleast in Pakistan seem to be weaker in intensity than winter storm ’18’. There is an upper air cyclonic circulation over Rajasthan while eastern trough is extending from south-east Arabian sea till north-east Arabian sea, this will cause the moisture from Arabian sea to strengthen the western system. In Pakistan, rainfall would remain below 75 mm to 80 mm starting from February 14 till February 17 in the northern areas. Chances of frequent precipitation in Killa Abdullah, Pishin, Killa Saifullah and adjoining Zhob including Quetta from February 14 till February 15 with few chances of isolated heavy falls. Precipitation to remain around >50 mm in these areas of Balochistan. Snowfall at times heavy could occur in Murree and other northern areas. Fresh Western disturbance ’20’ could affect the country after four to five days. Northern areas – Isolated heavy rainfall possible! Rainfall could be below 75 mm/80 mm in Muree (Punjab), Muzaffarabad (Azad Kashmir), Kalam (Khyber-Pakhtunkhwa), Besham Naran (Khyber-Pakhtunkhwa), Dasu (Khyber-Pakhtunkhwa), Saidu (Khyber Paktunkhwa), Kagan (Khyber Paktunkhwa) and Mardarn (Khyber Paktunkhwa)and other adjoining areas. During this period, Islamabad can around 50 mm to 55 mm with thunder/lightning and fast winds. While in Punjab especially north-eastern parts that are Sialkot, Jhelum, Gujrat, Gujranwala and Lahore – there could be rainfall with thunder/lightning along with fast winds. Rainfall of 35 mm to 50 mm here as per latest analysis. South Punjab that is Multan, Bahawalpur, Bahawalnagar, Rahim Yar Khan and adjoining cities may experience a light rain shower with chances of moderate falls that would remain around 10 mm to 30 mm on February 15 morning till February 16. Eastern South Punjab to witness more rain. Southern areas – Showers aiming Karachi again? There are chances of drizzle/shower in Sindh that is Dadu, Hyderabad, Nawabshah, Sukkur, Larkana and other surrounding cities) on February 15 but especially Sukkur and Nawabshah while rainfall under 10 mm could occur. Karachi may get 1 mm to 4 mm rain on the same day. Whenever PWP has forecasted rain in Karachi in winter season (2012 -2013), it rained! Western disturbance ’19’ is moving into India now, thus the rainfall in Pakistan would start to decrease from tonight/tomorrow morning. The system has brought countrywide rainfall however the temperatures have not much been affected like in previous cases. A low pressure is pulling the moisture into India as it moves towards central western parts of India from Rajasthan. PWP successfully predicted all four winter rains in Karachi this season though intensity varied. ← Asteroid heading towards Planet Earth! heavy showers to occur in twin cities?? and hail?? mostly moderate with chances of isolated heavy falls, hail may occur however more chances of hail in north-eastern parts of the country that is Punjab. is there chances of heavy rainfall along with hail storm in lahore???? Yes there are chances of heavy rainfall in Lahore with hail. babar bhai is there chances of heavy downpours along with hail storm in lahore???? Heavy thunder activity in my area (Safurah). heard it rained in karachi again..for 2 to 3 hours? is it true? and nice article btw. pwp ye wd 20 sindh ko affect kre gi ? aur iski intensity ka kch pta chla??? Not at the moment but wait for two days. lahore has experienced good rainfall today vry pleasent weather. is similar weather is expected durinh WD 20??? Yes more rainfall is coming! is there any chance of rain in pakistan especially karachi in the near future. i have seen weather map of bbc it shows another weather system could approach by wednesday..is true???? More rainfall is coming in the country however Karachi may remain dry. hoe much amount of rainfall did lahore recieve during wd 18 and 19.also want to knw the expected amount of rainfall in lahore due to coming wd 20? During WD 20, There are chances of some 50 mm to 75 mm may occur in Lahore. from satellite and other sites of weather the duration of wd 20 seems like that it would stay for a whole week in pakistan is it??? Do this website collecting weather data? There are monsoon data for some cities, while articles on main weather events. no data of daily temperature. Are there chances of snow in murree because of this new wd20? Well you should enjoy thunder and lightning it adds to the effect of rain i love it when its raining heavily and you can also hear thunder roaring. :) Lightning strikes are bad when it causes damage but that’s rare here in Lahore! umar khan where it thunderz a lot??? in karachi? Yes, it is starting to get wet but was dry in dec and jan.. In short, It depends upon the charges that is electron and positive charges etc. Nothing right now, waiting for winter to send first. “BREAKING NEWS: Third active February rain system (western disturbance ’20’) heading towards Pakistan; countrywide rainfall expected. Intensity is weaker than WD 18 but stronger than WD 19. Moisture is coming from the Arabian sea”. Yes, rain may occur in Karachi. Yes, it also helped a low to form over Rajasthan few days back. It is included, the strip of northern Punjab, Islamabad, Azad Kashmir and adjoining KP has the highest lightning strike. umar khan it thunderz only in winter or spring rainfalls nowadays. not in intense winter season and even not in monsoon so enjoy these 2 or 3 months. Are there any chances of rain in karachi on 20-28 of february.In the upper parts of there are chances of rain,but i don’t think that it’s rain in karachi these days and other else Allah knows. i need flood and heavy rain articles. What should i do, i mean from where in this website i will get the said? there is no rain in multan why? Are you sure? I am sure some rain might have occurred today or yesterday! babar bhai. monsoon conditions kab se banna shuru hoti hain?? bcz me bangladesh ka temperature dekh ra tha wahan to abhi se 33 34 degrees pe pohanch gia hai. to bay of bengal me monsoon activity kab se shuru hoti hai??? Babar bhai Larkana mei buhat heavy rain huwa hai aur yeh 5th baar heavy rain larkana mei huwa hai February month ka har bar rain system ki 2 din to rain hoti hai! and yeh aj sham sy start huwa hai aur kab tak chalega ? and i think ek aur new rain system araha hai sindh province me ?can you verify that ? Yes, also in Karachi heavy rainfall with intense thunderstorm also hail also occurred in this winter season. Another system is coming, Sindh does not have much chances from it. Mirpurkhas ki tareekh m aj 1st time itni Shiddat wali Rala bari hui hai with heavy 2 v.heavy rain…yeh kexy mumkin hua babar bhai? next system lahore me witness kia ja ske ga??? Chances of rainfall in Lahore as well..
when will the rain begin? No chances in Multan till some days. in 2012 the annual rainfall was recorded in multan is? The page that has these stats is currently facing some web problems, if the problem is solved then I will inform you. When the page would be fixed..
in multan the weather of this week is what? Partly/mostly cloudy with chances of drizzle. on which date this will happen? is there are chances of heavy rainfall with hail in multan in this week? there are chances of light showers or heavy showers?